Bus Éireann is registered with An Garda Síochána National Vetting Bureau to conduct vetting. This process is carried out in a highly sensitive and confidential manner. Why do we conduct Garda Vetting? Under the National Vetting Bureau (Children and Vulnerable Persons) Acts 2012 to 2016 vetting of personnel who work with children and vulnerable adults is required by law. The Act states that it is an offence for a person to engage in any work or activity with children and vulnerable adults, unless that person has been vetted by the National Vetting Bureau. Penalties will be applied to those found in breach of this Act. The Act applies to any person who is carrying out any work or activity, a necessary and regular part of which consists mainly of the person having access to, or contact with, children and vulnerable adults. Bus Éireann does not conduct vetting for individuals on a personal basis. (Bus Éireann assumes that the email provided is personal to you. We will not be liable if personal details are inadvertently disclosed through the email provided). Bus Éireann or a Bus Éireann Approved Contractor will invite an applicant to participate in the online vetting process. Following completion of the Bus Eireann Online Invitation Form, the applicant will receive an email from An Garda Síochána National Vetting Bureau (evetting.donotreply@garda.ie) requesting them to complete an online application. To access this application form an applicant will need their Email Address and Date of Birth. A list of all previous addresses since birth. The following information is required in relation to any criminal record that may be held by the applicant: Court Date, Court Name, Offence, Court Outcome. If the applicant does not access his/her invitation within 30 days, it will expire. Once expired the applicant will have to go through the Bus Éireann invitation process again from the beginning. The vetting itself is carried out by An Garda Síochána National Vetting Bureau and refers to an individual’s record of convictions in the Republic of Ireland or elsewhere. This includes all convictions and/or prosecutions, successful or not, pending or completed. The vetting process may also disclose information in relation to specified information such as pertinent information concerning a bona fide concern that there is a finding or allegation of harm to another person received by the National Vetting Bureau from An Garda Síochána or a Scheduled Organisation. 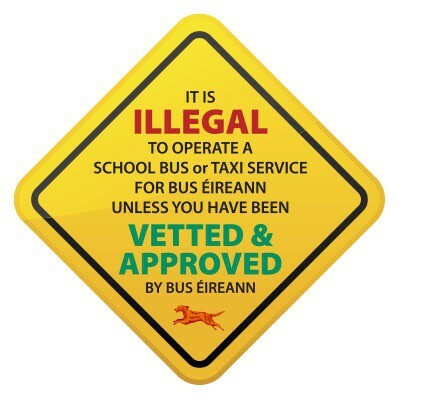 The outcome of the vetting process is assessed by Bus Éireann. Each case is treated individually and gives due regard to the circumstances notified. Bus Éireann acknowledges that, in certain circumstances, in order to safeguard our standard of services, it may not be appropriate for an individual with convictions or prosecutions (completed or pending, successful or not) to provide services on its behalf. Bus Éireann reserves the right at its sole and absolute discretion to object at any time to any person nominated as a driver of a school transport service. Where can I get more Information on Garda vetting? IMPORTANT: Please ensure you have the correct documentation before you press the click here button below. (i.e. School Bus Contractor or Bus Éireann Department), MUST BE completed, signed and dated before uploading.